The image you see here is of Noel Fielding, who is, like many of us involved in the arts, what I call a “comma creative”. Like Fielding, I have a lot of commas involved when trying to describe what I do. Fielding is an artist, a comedian, an actor, and a musician. It’s tough to nail down exactly what you are all about in a statement like that because the obvious thing most want to know is what you specialize in; a leftover from mid-century modern American where people did–or seemed to do–only ONE THING professionally, with all other activities being relegated to the dusty old basement of hobbyland. (Someone I know once referred to their air as a hobby, but I chafe at that description because it implies a casualness about it that doesn’t exist, at least not in her case). It’s very difficult to get people to take you seriously across disciplines sometimes. So how do you do it? 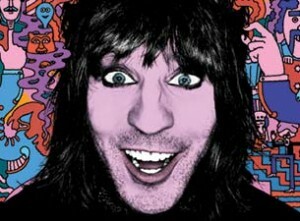 Noel Fielding is, in my mind, an excellent example of how to do it it right. Fielding does a lot of different things, but his great accomplishment is that he has grown a cult of personality about him; his work has interest, but the real draw–at least in my mind–is the artist. The person behind the work. That’s not an easy feat to pull off, but Fielding has managed to make everything he does a reflection of himself in some way. That’s not, as I mention above, easy to do. For a start, for this to work you have to have a likable personality and you have to deal with people on an individual basis. There’s no room for snobbery with this approach, there’s no room to be the reclusive shut-in art muso who just knows nobody understands the work. Bad behavior is out, being friendly and inclusive is in. I know what happens when you’re at odds with fellow creatives or art patrons in the space where you live and work. I’ve not experienced it personally but a few times, but watching others fall into the same traps, I’ve found over the years that it pays to be nice–and not that phony sort of nice that barely conceals your real inner disgust with the whole of humanity, either, but genuinely nice, legitimately friendly. Everyone you know in and out of the arts is a potential ally. A lot of people you know might not buy your work. They will come to your openings and eat your cheese and drink all your wine, but they have their own reasons for not buying. And that’s not the point, anyway, if you’re smart about your work–there is an audience for every kind of statement, a new set of eyes for every creative work. The people your work is right for will buy when then can afford it. The wrong people for your work shouldn’t take it away from the right people anyway. Is that naked idealism? Naturally, I’m talking about originals here. All bets are off when it comes to tees and prints. All your free wine guzzling friends should own your t-shirts even if its just at break-even prices. You don’t make prints and tees to promote your work? Well, keep it in mind for later, that is basically a walking billboard for your work that you could get a lot of mileage out of. He’s brilliant exactly because he has found a way to attract a great deal of interest in just about any project he’s working on. And that might just be the key to success in a very crowded marketplace–growing interest in you personally can result in an increased awareness of what you do. It’s NOT for everyone–Fielding himself noted in an interview on YouTube that the very second when his signature program The Mighty Boosh got popular, there was a backlash. Ubiquity breeds contempt, and it’s a fine line to tread when you’re gaining visibility and recognition. But for those who can find the balance, the rewards are great.